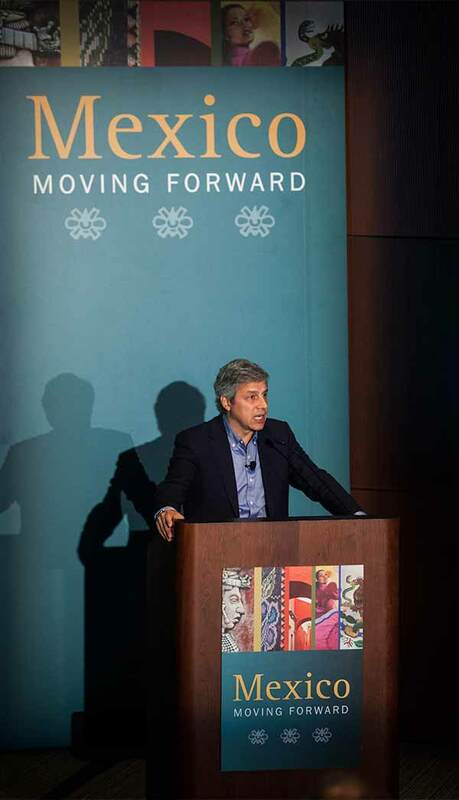 Calling Mexico’s national education system “failed,” guest speaker Claudio X. Gonzalez, president and co-founder of the nonprofit Mexicanos Primero, spoke passionately about the importance of education reforms. Mexicanos Primero is a non-partisan organization advocating for improving public education for young Mexicans. Gonzalez gave several statistics on education and educational outcomes, comparing overall time spent in school, average years of schooling and graduation rates around the world. For instance, Mexico’s high school graduation rate sits at 47 percent for 2014, below the United States’ 79 percent and far below Germany’s 95 percent. Average years in school for Mexican children is under nine years, lower than the United States’ average of 13 years, and Mexican students spend an average of 900 hours in class each academic year, or 4 ½ hours a day. That’s almost half the time spent by Korean students, the highest ranked group. Gonzalez then presented two goals and four solutions for education in Mexico: catching up with the world in both quantity and quality of education by putting the government in charge, by the professionalization of the teacher force, by increased transparency and efficient spending on education, and by school autonomy and participation. Positive steps taken so far under the government reforms, he said, include mandatory exams for potential teachers followed by regular assessments and professional development, an autonomous evaluation organization for schools and teachers, and the creation of the nation-wide System for Education Information and Management, in part to resolve corruption. Former California Senator Denise Moreno Ducheny serves as the Center for U.S.-Mexican Studies’ senior policy advisor. In her welcome remarks, she touched on the importance of education for productivity and quality of life in our cross-border region, highlighting the continued momentum around binational cooperation here on the border and the increased collaboration among universities, companies and elected officials in our region. The dean of UC San Diego’s School of Global Policy and Strategy, Peter Cowhey, said the Center for U.S.-Mexican Studies continues to play an important part in cultivating a strong political, cultural and economic relationship between the two countries. USMEX is based at the School of Global Policy and Strategy. “The center has truly a distinguished history,” Cowhey said. 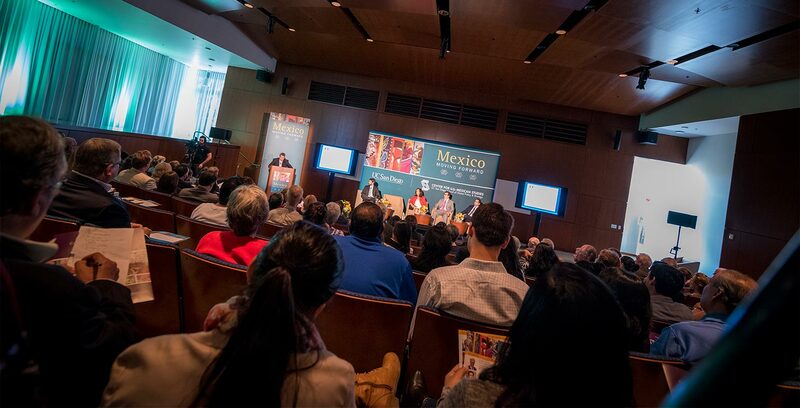 “It was created in 1979 and the centerpiece, the crown jewel of its programs, has been its fellows program.” With more than 600 research fellows in residence to date, the center has played a valuable role in providing a “safe and deeply principled” space for policy choices for both Mexico and the binational relationship, he said. 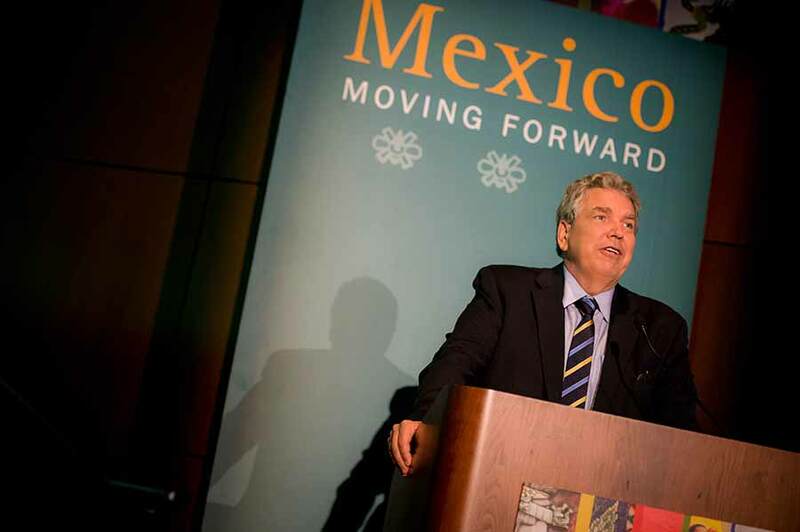 “This has created, if you would, the largest and strongest network of analysts of Mexico and the bilateral U.S.-Mexico relationship in either country,” Cowhey said. The complete Mexico Moving Forward: Recapturing the Mexico Moment will be broadcast on UCSD-TV and includes three panel discussions ranging from an economic discussion featuring Carlos Capistran, a UC San Diego alumnus and the chief Mexico economist at the Bank of America Merrill Lynch, to a look at how civil society is transforming Mexico with Jose Merino, director of Data4 and professor at the Instituto Tecnologico Autonomo de Mexico. 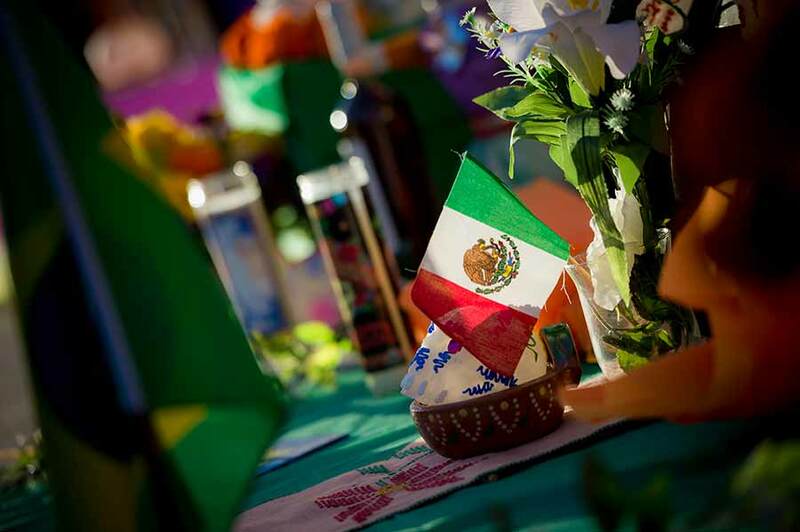 Following the discussions, attendees were treated to a Dia de Los Muertos celebration with traditional Mexican food, decorated altars and a live mariachi band. Learn more about the Center for U.S.-Mexican Studies at UC San Diego.